Unique, innovative boots that really push the envelope way ahead in terms of downhill performance (at this weight point) but have some design and branding inconsistencies for actual backcountry and uphill use. Cons: Claimed easy transitions leave you in a tour mode that is significantly compromised., binding and crampon compatibility limited. Dynafit keeps throwing hail mary passes with their ski boots. We like the way they push innovation and repeatedly revolutionize the business. The Hoji Pro Tour boot is the unique AT boot offering in years and years, and it shows. Downhill performance is amazing. And the good news is that that downhill performance doesn't inherently inhibit uphill and backcountry performance. There are some other design and engineering attributes of the Hoji boots that compromise uphill performance, but behavioral and accessory adaptations mitigate these other issues. Basically, put some thought into your whole skiing kit and your expectations for transitions with the Hoji boot, and you will find a pair of excellent backcountry skiing footwear. The eagerly anticipated and much-lauded (in pre-release testing) Hoji Pro Tour is a solid backcountry skiing and ski mountaineering boot. It brings unique engineering and innovative features to the market, but is still surpassed in some ways by more traditionally constructed boots. Overlap boots are now lighter and more proven, while beefed-up randonnee racing boots tour way, way better. Some quirks of the Hoji boot keep us from granting it our highest award, but it skis well. Most interestingly, the Hoji boot skis downhill as well or better than most overlap constructed boots. Generally, we expect overlap boots to ski the best of the major design options. However, the "three-piece" construction of the Hoji boot is tuned for no-play, progressive downhill stiffness. We dig it and you will too. Overall, these boots challenge the front runners. On our overall matrix, we balance uphill and downhill attributes for how we ski and see the mountains. If you prioritize downhill performance more than we do, generally, the Hoji boot might be worth your while. Though, we'd also bet that those of you that greatly prefer downhill performance might do well to opt for something like the Top Pick Lange Freetour. Fast, deep powder for days. No matter your style of backcountry skiing, the Hoji Boot is worth your consideration. "Uphill performance", in our scoring matrix, is purely a function of cuff range of motion and friction within that range. We score weight elsewhere. In terms of touring cuff range and friction, there are two distinct modes of the Hoji Pro Tour. If used "as designed", uphill travel is below average. If you use it as most use their boots, uphill performance is about average. Let us elaborate. Dynafit has designed and marketed the Hoji boot as having a one-step uphill-downhill transition. With their "pants down always" branding and intention, the cuff lock, upper buckle, and power strap are activated and (partially) deactivated all with a mid-sized rear lever. When you adjust everything and use the boots this way, you get a tour mode that works but isn't as free-flowing as other options. The range and resistance in this "pants down always" mode is on par with something like the Best Buy La Sportiva Spectre 2.0 or the former Editors Choice Salomon Mtn Lab. If you further loosen the buckles (requiring a pants cuff lift), you get range of motion more in line (but not yet quite as good) with that of the Editors' Choice Tecnica Zero G Pro Tour. It is important to note Dynafit's "Speed Nose" design, employed on the Hoji Pro Tour and on the Editors Choice Dynafit TLT 7 Performance. By eliminating the traditional ski boot toe "ledge" (used in attaching some bindings and all automatic boot crampons) Dynafit can move the tech fittings further back, placing the pivot point in tour mode closer to one's foot. This has a noticeable, but very very minor advantage in touring. There are usability issues with this, noted below, that make it a net disadvantage to our review team. For long touring stints, completely undoing the buckles of the Hoji Pro Tour is advised if not required. Here, Phelps Lake in Grand Teton National Park. The Hoji Pro Tour, in size 26.5, weighs 6 lbs 2 oz. For as good as this boot skis, this is remarkable. When you consider that, just three years ago, we were excited for the 6 lb 5 oz La Sportiva Spectre, the Hoji mass is remarkable. At a lower weight, the Hoji skis way, way better than the Best Buy Spectre. Materials are carefully chosen and stripped down on the Hoji boot. A close up of the innovative but problematic Dynafit 'speed nose'. Touring efficiency is indeed enhanced, but not by much. Our team really liked the downhill performance of the Hoji. The biggest difference between the Hoji and other boots is the way the cuff locks to the lower boot shell. The tensioned mechanism creates a more positive connection that is very obvious in head-to-head "carpet testing". All other reviews focus on this difference. It is indeed noticeable and better. However, we found that the positivity difference is virtually lost in all but the most discerning ski testers in very optimal conditions. The major perk of the Hoji boot's downhill performance is its smooth, stiff, and progressive forward flex. The graduated forward flexion is something we would expect from a resort overlap boot, not from a six pound touring boot. These things ski very, very well. The only boots that ski better, downhill, are the Top Pick Lange XT Freetour 130. The innovative Hoji boots ski really, really well. In some ways, their clever attributes mask and distract from the excellent downhill skiing performance. Of course, most will have at least some work done on their AT ski boots to optimize fit and comfort. Our comments here, then, are very generalized and should be considered just a simple starting point. The liner included with the Hoji Pro Tour is soft and comfortable against your foot, right out of the box. For ongoing performance and fit, a stiffer liner will be better. Be careful about being seduced by the puffy and soft liner. The overall fit of the Hoji is relatively narrow, with a tall and roomy toe box and a tight heel pocket. The "Hoji Lock" is indeed innovative but doesn't quite do what you wish it would or what it claims to do. Warmth is a function of fit (get your boots dialed in for maximum foot health) and amount of shell and liner material. The shell of the Hoji is thin, but the liner is pretty thick. The result is relatively warm boots. They are certainly more insulating than both our Editors' Choice winners. We have a few answers to the question "how easy are the Hoji boots to use?" If you use them as intended for skin-accessed skiing in simple tech bindings, the Hoji boot is slicker than any other all around or high performance AT ski boot. The "Hoji Lock" transition closure is brilliant and replicates skimo race gear in transition ease. The catches, though, are multiple. First, as noted above, touring mobility suffers until you lift your pant cuff and loosen things up further. Next is the very odd "Speed Nose". Dynafit, like they did with their TLT7 Performance boots, omitted the toe welt/ledge for the Hoji boots. For tech binding skinning, this saves some weight and moves the pivot closer to your toes. These are good things. However, it preempts use with certain bindings and it makes crampon use complicated. There are workarounds to the crampon thing, but it isn't straightforward. Overall, the usability issues, especially as compared to branding and marketing copy, of the Hoji are multiple and significantly hamstring the overall performance. In regular tech bindings (here, the Marker Alpinist) some of the usability issues of the Hoji boot are mitigated. Those usability issues are attributable, in part, to the "speed nose" you can see here. These are great downhill-oriented ski touring boots for he or she that will access their skiing on skins and with "normal" transitions. The downhill performance is indeed above-standard, but the marketing copy around transitions is a little misleading and the complications around the unique toe profile are daunting at best. It is refreshing to watch Dynafit's top of the line AT ski boots come down in price. This is their flagship boot and it is hundreds of dollars less expensive than previous Dynafit high-end ski boots. Provided the complicated "Hoji Lock" holds up for you, you will get years of excellent service from these boots. Note, though, that you will likely need to replace the liner for truly good fit and lasting performance. Some of the boots we tested recently, stacked up next to the Dynafit Hoji. From left to right: Tecnica Zero G, Scarpa Maestrale, Dynafit Hoji, Scarpa Alien RS, Atomic Hawx Ultra 120. We like the Dynafit Hoji Pro Tour but are not yet willing to make the enthusiastic recommendations that other reviewers are bestowing. We continue to stand by our methodology and conclude that so much of the other content you might find online is from reviews that are at least a little biased. 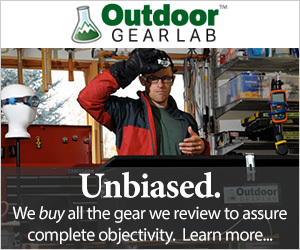 The OutdoorGearLab model keeps the PR departments and associated obligations out of the mix. It is tricky on our end, but the result is that we can make thorough comparisons and draw authoritative conclusions. Backcountry $639.96 - 20% off! MooseJaw $808.99 - 10% off!